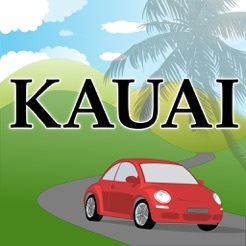 The Kauai GPS Tour Guide talks to you as you drive around Kauai! It's like having a local expert with you in the car as you explore the island. 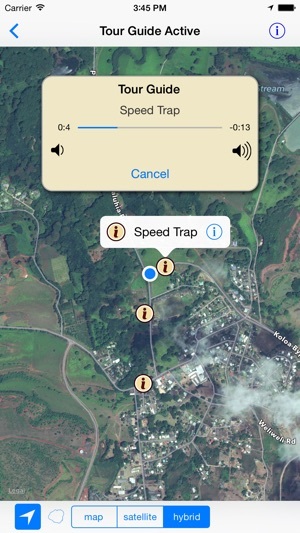 Using the GPS built into the iPhone or iPad 3G, the Tour Guide knows exactly where you are and alerts you to hidden beaches, scenic lookouts, historic sites, hikes, waterfalls, snorkel spots, movie locations and all of Kauai's most interesting tourist attractions. You'll also learn about Kauai's history. - Includes over 200 points of interest. 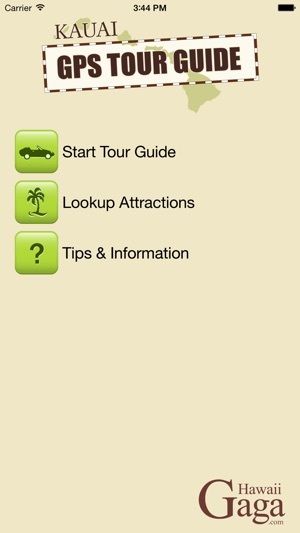 - The Tour Guide alerts you to hidden attractions. - Interactive map shows exact locations. - Comprehensive beach and snorkeling guides. - Discover walks, hikes, and waterfalls. - Weather and surf forecasts. - Doesn't require cell phone coverage or data roaming. Utilizes your device's GPS. - Listen to music in the background. The Tour Guide will pause music when she speaks. - The Tour Guide uses a human voice. Developed Specifically for the iPhone by Island Residents. The Best Way to Discover Kauai! Fixed app freezes in iOS 8. This also fixes reported iPhone 6 freezes. Listen to music in the background. The Tour guide will pause music when she speaks. We loved the GPS tour! 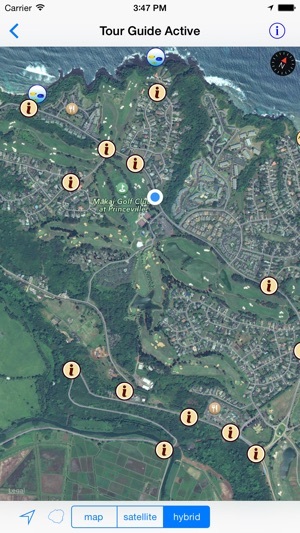 The app made the longer drives to the North and South shores more fun. The beach road turnoff suggestions were on point. The history of various spots on the island was very cool. The only thing I did not like was the app had to be open and phone screen left on. Any time you turn off the screen or phone goes into lock mode the tour stops. Not a problem if you remembered your car charger big problem if you didn't. It also ran my phone pretty hot, no more so than imaps but definitely would prefer to click the screen off and still continue the tour. I wish there was more added occasionally through updates. It is the tiny isle Kauai and the tour is really fun but I think there is a lot more that could be said. 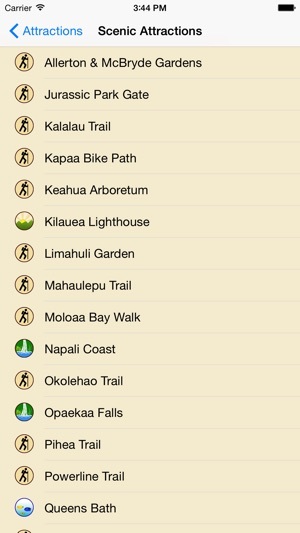 Overall, this was my go to Kauai App and not the popular book series app simply for the fun guided tour. I loved the chimes before she spoke and loved her voice too. Great job! Keep it fresh. Mahalo! 1 - in many instances we had already passed the street or location mentioned by the guide before the guide was finished describing the sight; . The speaker should start earlier giving more time to listen and then stop to view the site mentioned. 2 - the guide does not differentiate between direction travelled - it does not mention if you have to turn left or right depending on the direction travelling. ; 3 - once the guide talks about a site it does not play it again unless the guide is reset - it took us some time to figure out how that we had to reset the guide; we had passed some sites we wanted to see on our way out of lihue and were hoping to stop on the way back but the guide did not repeat the info until we reset the machine. Once we figured out how to reset we were able to use the app. 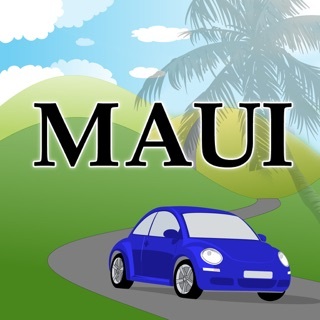 The app did make our drives around the island more enjoyable and worth the money. I think our suggestions would improve the operation. 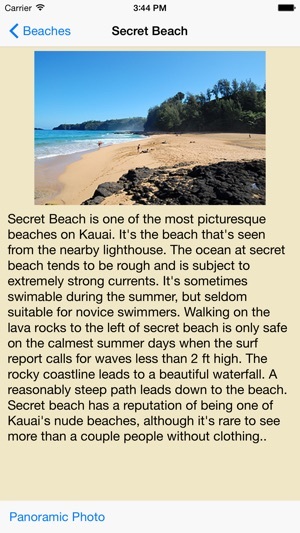 The app is ok but it does not provide anything that you couldn't get with google maps and a guide book on beaches. the most useful part of the guide is the beach breakdown, as it points out better places for leaning to snorkel, snorkeling and places where you shouldn't swim. The app is full of useless information that is somewhat randomly organized. I also believe that some of the so-called shopping complexes may have paid for advertising, as only certain ones are mentioned (without any distinguishing reasons). Finally, the app does not make use of the GPS feature, as it does not provide any helpful directions or parking suggestions. © 2010 Pretorius & McGrath Ltd.